We are the school that strives to provide the best education to students. We are looking for a qualified teacher who have the heart for children and commit to the learning experience of them. If you share the same philosophy, we invite you to apply to our opening position. 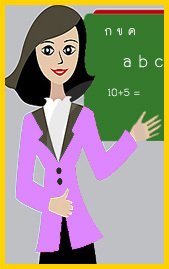 - Native English speakers with experience in teaching young learners. Interested applicants, please send your CV and a cover letter with a recent photograph to tothunyawit@gmail.com. We regret to inform you that only shortlisted candidates will be contacted. Thank you for your interest in Thunyawit School.